Example: For shading, I have soft charcoal pencil, and 8B graphite pencil. The charcoal pencil I have does not have a specific label except the word "soft" written on it. Both of them are known for dark strokes. What are the guidelines for deciding which one to prefer for shading a flower pot among the above? Does types of paper also play a role in choosing between these two types? I have used both charcoal and graphite for art projects. I have personally never combined the two in a single project. Charcoal is generally much darker, bolder and messier. It's easy to fade charcoal or wipe it off the paper entirely if you make mistakes. Charcoal, due to its brittle nature is also easy to smudge or gently wipe to assist in your shading efforts. Charcoal artwork needs to be treated after you're finished with the work as the particles (essentially dust) will fall from the artwork over time and may either leave dark streaks on the artwork or just cause the art to fade as the particles fall over the art or off of it all together. Graphite is a slightly harder to shade with, and doesn't usually get as dark as charcoal. Some of the darker graphites, like an 8B, tend to look glossy and reflective when used over large areas. This is something charcoal does not do. Graphite can be easily shaded with the help of tortilons, though, and varying pressure in combination with pencil grades can give you a very wide range of shades to work with. Graphite also lasts on the paper without particles falling off and can remain in-tact for years as long as its not being touched or rubbed. The paper you use plays a big role on the art itself. Some papers, like newsprint are great for quick charcoal sketching and practice. Charcoal easily wipes from newsprint and it's cheap, while graphite is hardly visible. Higher quality papers are less forgiving of errors, but the finished product will look nicer. HB & Hard (Not shown) will be your lightest B-scale. You can find in-between values, and up to 9B, but this gives you the general idea. Charcoals will generally be darker, and they will be in blacks. Pencils will be lighter, and in grays. There's not a 1 to 1 relationship between the values of the charcoal scale and the graphite scale. The scale is based on the hardness of the material, not by the value it produces (even though we select which one to use based on the value it gives). Pencil charcoal will leave a rougher texture and show the texture of your underlying material, and sometimes have a bit more dusting. Compressed charcoal will be much smoother in texture, more like graphite. Willow charcoal will tend to be a little more gray and smoky colored than pencil or compressed charcoal. 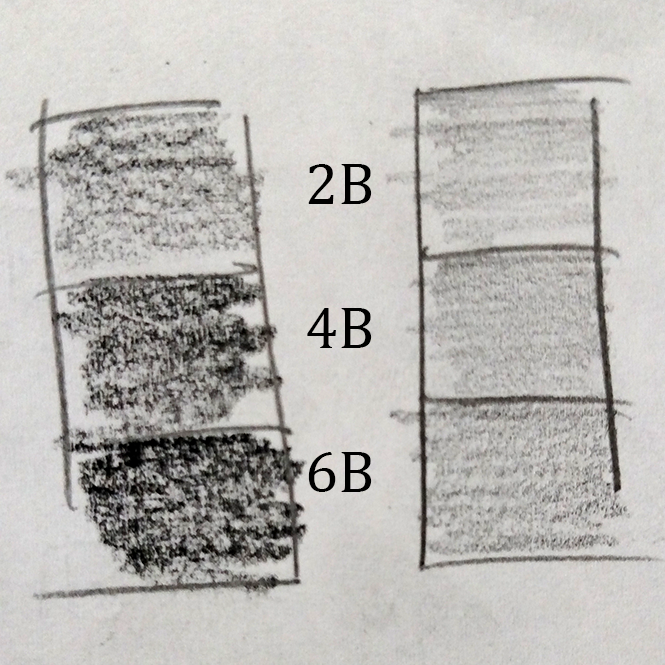 Here's a quick and dirty comparison between some of the common types of soft scaled charcoals and pencils. As I said, quick and dirty. (I'm working on a larger-scale version, but I need time to break in some pencils I don't use often). These were made by laying down the lightest value I could with each type. Lighting conditions were not ideal, but you can see the difference. Not the answer you're looking for? Browse other questions tagged drawing pencils charcoal or ask your own question.